MySpace is back. The social network has now reinvented itself as a social music app, with the backing of another mid-noughties titan, Justin Timberlake. You can sign in with your ‘Classic’ MySpace details, or with a Facebook or Twitter account. Once inside, you’ll find New MySpace is very different. 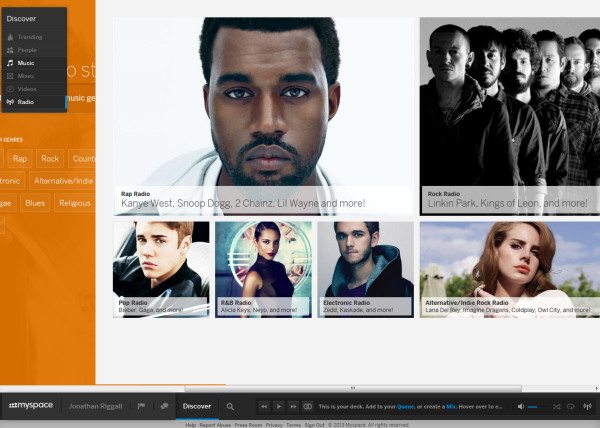 It’s got a bold, clean design and is focused on music discovery. The bottom of the interface is a player, where you can queue songs and make mixes, while the main interface allows you to discover, search and connect with the music and artists you like. The Discover tab is most impressive, with articles about new music and artists, as well as submitted mixes (like Justin Timberlake’s own History of Rap III!). You can now search for people filtering for gender, age, location, musical interest and profile types. You choose your profile type when you sign up, so you might choose DJ/Producer, for example, and you can search for other people like you on the network. While it looks like a competitor for services like Spotify, in terms of what music you can find so far, New MySpace feels limited. Doing some unscientific browsing of things I like, I found that there’s a lot of music from a few years ago when MySpace was a really popular way for artists to share music. It claims to have ‘the world’s largest library of digital music’, but it doesn’t look like it so far. New MySpace has the advantage of being free, the high profile backing of Justin Timberlake, and a lot of users, even if they haven’t signed in for a few years! If they get the discovery aspect right, it might be entice users back, but it will need more than an attractive redesign to take people from Spotify, Last.fm, Rdio or Grooveshark. Check out New MySpace and tell us what you think!